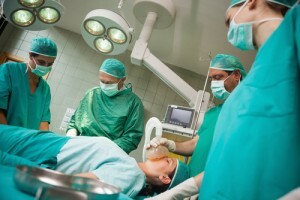 Is Robotic Surgery Safer Than Traditional Operations? Our law firm is reviewing da Vinci robotic surgery lawsuits. I have been writing critically about this medical device and its manufacturer, Intuitive Systems. Much of my commentary has been of the, “This is really cool technology that they are misusing and one day this will be really great” variety. But a new study is making me question even that premise. Doctors at the University of Texas Southwestern Medical Center conducted a study that was published this month in Obstetrics & Gynecology titled Comparison of Robotic and Laparoscopic Hysterectomy for Benign Gynecologic Disease. This is a major peer reviewed journal. These journals typically only publish studies with sound methodology. The study found that using robotic surgery to perform a hysterectomy is not safer than laparoscopic surgery. Okay, so the risks are basically the same? That’s probably fair. The study showed a slightly higher but statistically insignificant difference between robotic and laparoscopic surgery. Certainly, there are some complications that the study found are more likely with the robot. For example, the rate of postoperative pneumonia is much higher. Then again, the need for blood transfusions is higher for hysterectomies performed laparoscopically. So it is a mixed bag. Where the differences are more stark is in price. Robotic surgery costs a whopping $2,5000 more than laparoscopic surgery. Will these costs come down over time? You would think so. But who knows? This study echoes another study earlier this year published in the Journal of the American Medical Association which found that this surgery was no safer preformed with da Vinci… and was a lot more expensive. At least one study has indicated that robotic surgery is not as safe. So what does this all mean? Does it mean these are bad robots that we should recall? I can’t go that far. The early returns suggest that this technology falls somewhere between just as safe and less safe as traditional methods. Certainly, it is a lot more expensive. This will probably not be the slogan Intuitive Surgical puts on its bumper stickers. But that seems to be the reality of it. One thing that is a little bit unique to these mass tort cases is that there is no class action lawsuit. Each of these cases is being decided individually around the country. Intuitive Systems won the last trial. But that loss was actually a win for the plaintiff: she had already settled a medical malpractice lawsuit against the doctor. I think it is pretty clear Intuitive Systems wants to get these cases settled. There are too many cases pending and I think we have already seen the results: some hospitals are having less zeal for this technology. I’m not seeing the same push from hospitals bragging about their having the technology. Some of these da Vinci claims have already been resolved. I think it is reasonable to expect another waive of settlements. If you believe that you have been injured during a da Vinci robotic surgery, we can help you. Call us toll-free at 1.800.553.8083 or go online here. We handle medical device product liability cases and medical malpractice cases nationwide, and we have relationships with experts who can determine what went wrong during your surgery.